Recently I had the opportunity to check out some of the newest toy releases coming to Indigo in time for Christmas. I was blown away by talking unicorns, robotics kits and the newest Star Wars toys. I also was quite intrigued by something called Osmo. I knew I needed to get my hands on one to see what it was. Here’s what happened when Will and I spent a few weeks getting to know Osmo. Basically, Osmo is an accessory to an iPad. The Osmo Starter Kit comes with everything you need to take your kids from on screen apps to hands-on puzzles and drawing. It changes the way kids play with an iPad by taking the experience to a whole new level. Basically, the Osmo itself is a base that holds the iPad and a reflector that sits on top of the iPad. This combo makes an interactive playing field in front of any iPad that allows your kids to do some pretty cool things. The Starter Pack comes with all you need including puzzle playing pieces and letters that interact with the free Osmo apps. Tangram: Tangram was the first app we dowloaded and the first part of the kit that we opened. The bright and colourful puzzle pieces were enough to get us all down on the floor excited to see what would happen. Tangram is a puzzle challenge and a very fun one. You complete tangram puzzles by looking at the puzzle on the screen and replicating it on the playing field in front of the iPad. There are different levels and the beginner puzzles show kids what shape and colour piece they need. As they progress through the challenge, the puzzles get harder and it can be quite challenging to determine which pieces will combine to make the shape on the screen. What I liked most about this was there were quite a few beginner levels to choose from so smaller kids can use Osmo Tangram without getting frustrated. I also liked how challenging the puzzles became and began trying to figure some of them out on my own while the kids were at school. A key note here is that you need to really keep the puzzle pieces together and put away when the kids are done playing. We lost a purple piece briefly and without it you cannot complete the puzzles. The good news is that the pieces all fit nicely in a sturdy holder that won’t break as soon as they open it. 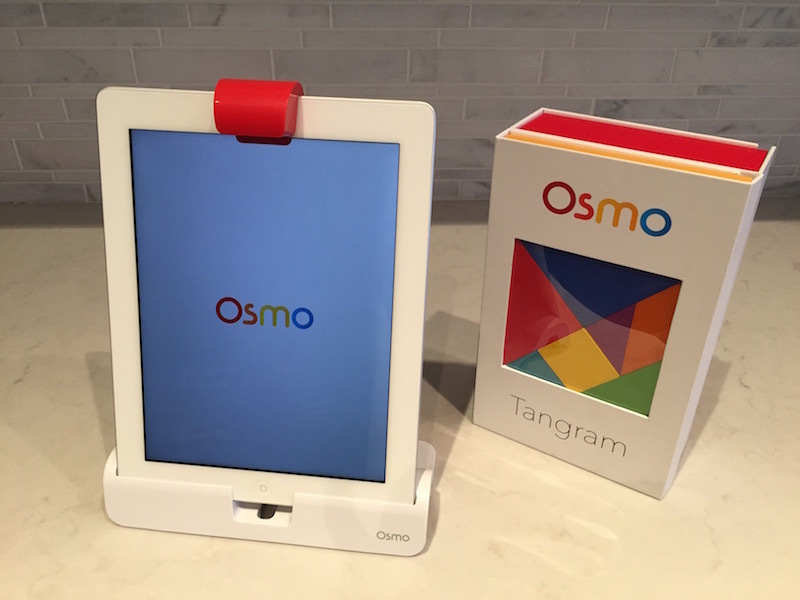 Words: The second app we tried was Osmo Words. To play words, you need the red and blue letters that come with the Osmo starter kit. I worried my kids would equate this to homework but they seemed really quite interested in playing. For younger kids, the app provides a photo and kids need to guess the word and spell it out. The starter words tend to include three letter words like egg and dog. The words like tangram puzzles have different levels. There is also the opportunity to play a versus match with friends where one kid has blue letters and one has red. It’s a race to see who completes the puzzle first. One of my favourite parts of this level is that you can build and customize Osmo Words using your own pictures and words. Thus, I can take Will’s words of the week from school and integrate them into the game. He can also build levels for Charlie which he loves. Masterpiece: Newton is where Osmo got me on how different it is. Masterpiece has a selection of art colouring pages that children can choose from. When you select a photo like a dragon, you can place a piece of paper in the playing field and trace the image onto the paper using the lines on the screen and the image of your hand on the paper. I love this for many reasons. Firstly, Will hates colouring. He is also not particularly great at penmanship. This app got him interested in drawing again and helped him follow lines as he is required to do at school. The best part of Masterpiece is its ability to use the iPad camera to turn anything you take a photo of into a colouring page. Will immediately started doing this and loves to trace out Nintendo characters and other things he finds around the house. I didn’t know what to expect when we tested out Osmo. At just under $100 for the starter kit, I knew for it to be worthwhile it would need to entertain and intrigue both my kids. Osmo took them from playing simple games when they had access to an iPad to solving puzzles and more. I don’t often let them play iPad because I haven’t found too many apps that I find overly engaging and this changed when we found Osmo. Now the iPad charges in the Osmo base and doesn’t ever leave our kitchen counter. The first things the kids ask to do on playdates is show it to their friends. I’ve had many an afternoon where 4 kids have crowded around the Osmo working on Tangram puzzles together. 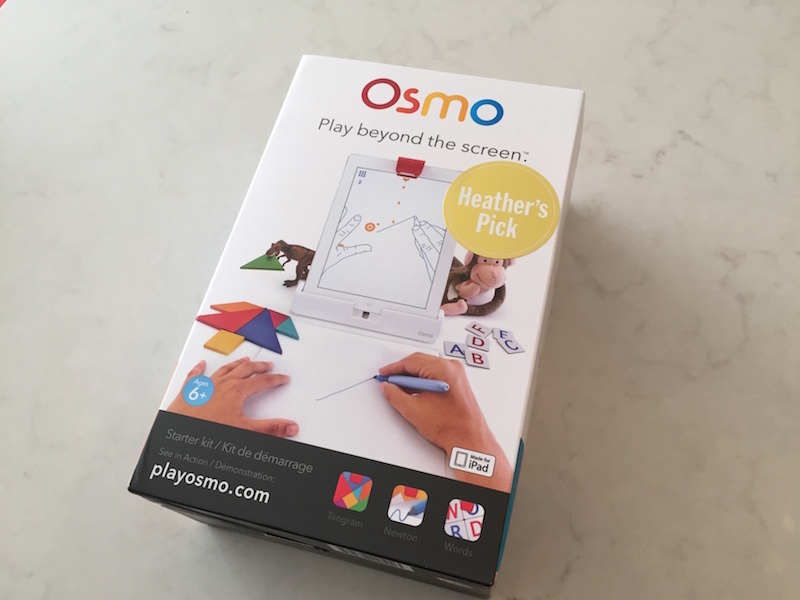 Whether you buy educational toys often or have kids that are just into technology, I would seriously recommend looking into Osmo for the Christmas season. We use it on rainy days, to help with homework and during family game night. I wouldn’t really trade it for anything except maybe a real life taking unicorn. You don’t need to take my word for it, Will has prepared this video to show off what he loves best about Osmo and how the system works.